Simply put, we are San Francisco’s largest Mobile – public open-air – fine art gallery exhibition. Our premise is showcasing only original art. Why would we be interesting for you – as an Artist? For over 15 years, our mission has been to change the way People experience art. Our weekly exhibits bring the public face to face with the art and the artist. Whether it is Nob Hill or Union Square, Music Concourse or North Beach, each exhibit is exposed to a revolving potential client base. Our artists have the opportunity to connect directly with collectors and art lovers who have the means to own their work. San Francisco is an International Marketplace. How would this affect you as a member of Red Umbrellas? The City of San Francisco provides our Artists with what is arguably the largest international gathering of qualified art buyers. Each year thousands of tourists, art industry insiders, and locals come to our exhibitions in search of art and the artists that are shaping the trends in galleries. 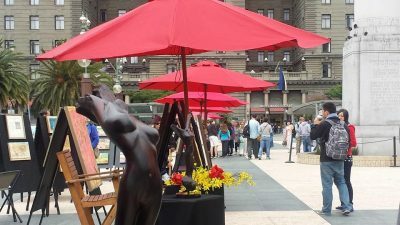 Red Umbrellas exhibitions attract potential clientele such as gallery owners and managers, art dealers, interior designers, architects, corporate art buyers and private collectors. This provides a tremendous exposure of your work and an opportunity to make art full time. San Francisco and the Bay Area is a home to more artists, galleries, art lovers, collectors, and industry professionals than any other city in the world and it is one of the top 3 cities in the world for art sales next to NYC, London & Paris.